Isomatic offers low price laminated, C-core, toroidal, ferrite and resistance welding transformers and coil winding. Isomatic designs, manufactures and supplies , welding transformers, small transformers, coil winding, C cores and toroidal cores (toroids). 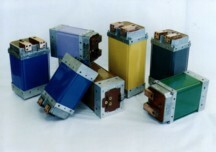 Isomatic has developed a range of resistance welding transformers and successfully brought them to market. A prime example is the ISO10656 integrated 'transgun' transformer for robot and manual weld guns pictured below left. We also produce transformers in the dual-voltage USA style and for non-integrated applications. A new range of medium frequency transformers is now available. In collaboration with other companies Isomatic has also developed and manufactured transformers for MIG/MAG (GMA) welding machines. 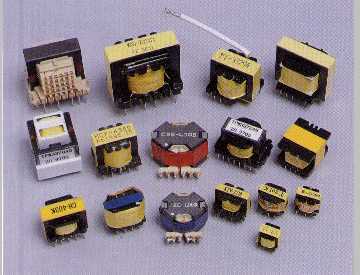 Examples of small transformers, laminated, C-core, ferrite and toroidal, are shown below right. Established in 1976 as an R&D laboratory in the field of robotics and industrial control systems Isomatic Lab. was privatised in 1992 since when it has multiplied its turnover by more than 11. Now the main activities of Isomatic Lab. are design, programming and manufacturing in Electrical and Electronic Engineering and Information Technologies in co-operation with Isomatic UK. Isomatic Lab. works in close collaboration with the Technical University in Sofia and other Bulgarian and foreign academic institutions as well as leading European and US companies. Isomatic has participated in European Commission funded projects with 24 partners from UK, Spain, Italy, Bulgaria, Romania, France, Greece and the former Yugoslavian Republic of Macedonia. Isomatic Lab. has a production line for standard and custom built transformers (including the ISO10656 integrated welding transformer range for robot guns), resistance welding equipment and low cost coil winding services. NOTE: Internet Explorer might require the use of the Home Page link at the top of the contents list in the left-hand Isomatic UK frame. Netscape and Mozilla work fine whichever you click. This page was updated and its HTML syntax checked on 10 February 2013 using BBEdit on a MacBook Pro . Isomatic UK is a member of the Institution of Electrical Engineers Consultants Professional Network. The following links to a few of the other members might prove useful. Tony Booth - Instrument design and system analysis in optics and electronics ... diode laser applications development. Electrostatic Solutions Ltd - Static electricity and electrostatic discharge (ESD) R&D, consultancy and training services. ESD in electronics manufacture. Electrostatic hazards advisory services. Static electricity applications. Advanced Technology Electronic Interconnect Products and Services. High Energy Physics, Nuclear Instrumentation and High Power RF systems. PES helps people develop, invent or improve their products and processes. The following links to potential suppliers and subcontractors might prove useful. Voltage Converters Offers a wide selection of voltage converters, voltage transformers and step down voltage converters. Also a Voltage Conversion Guide and FAQs. Test and Measurement Equipment. GlobalTestSupply.com is the leading online source for new and refurbished test and measurement equipment. Yulin - Manufacturer of Printed Circuit Board Specializes in Single, Double Sided and Multi-layer PCBs. From design layout to low cost proto-types, to best price production Yulin Technology is your PCB solution. Crosslink Technology Inc. Formulated Epoxies, Urethanes and Custom Cast Electrical Parts. Kleeneze Holland Franchise Description: Join the number 1 work from home business opportunity in the UK and Ireland. Launching into the Netherlands, key people required now! Apply for your free no-obligation information pack. The world's leading small business opportunity and franchising information website, providing free resources to anyone interested in getting more information on any small business or franchise. Ampair natural energy for wind and water power. The Conference Guide - Search thousands of conference venues online. NOTE: Internet Explorer requires me to then click the Home Page link at the top of the contents list in the left-hand Isomatic UK frame. Firefox, Mozilla and Safari don't require this extra step.